A number of people are hesitant to undergo surgery to alter their appearance, such as with a facelift. While a facelift is generally safe and gives great results, there are certain people who do not need the degree of improvement that it provides or who may not want to take the risks associated with surgery. Those with moderate facial sagging can achieve a rejuvenated appearance with injectables. These treatments involve very minimal risks, can be performed in under an hour, and require no downtime. Injectables can take years off your appearance by correcting volume loss, fine lines, and wrinkles to achieve a naturally youthful appearance. 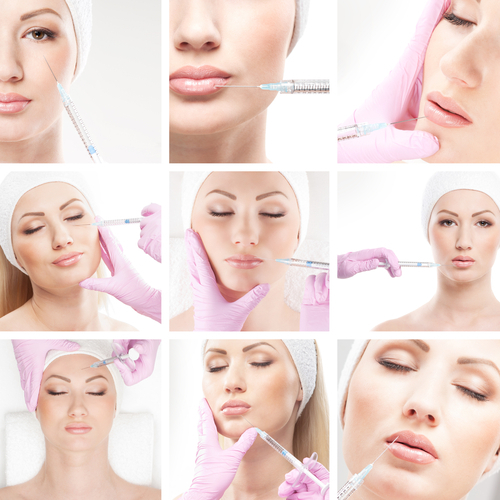 Although there are many different types and brands, there are two basic categories of injectables: neurotoxins and dermal fillers. When we move the muscles in our faces, such as when making expressions, the skin folds. Over time, the collagen and elastin in the skin break down. This loss of elasticity prevents the skin from returning to its smooth appearance, and permanent wrinkles develop. Neurotoxins such as BOTOX® work by temporarily reducing the communication between nerves and muscles that cause these wrinkles. By decreasing muscle movement, not only is the skin immediately smoother, but future wrinkles are also prevented. Twin studies with BOTOX® showed dramatic improvement in skin aging for the twin who used BOTOX® versus the one who did not. BOTOX® injections are the only FDA-approved product for both frown lines and crow’s feet. It can also be used to improve a “gummy smile,” neck bands, and forehead and lip lines. In addition, 70 percent of patients report at least 50 percent decrease in symptoms when BOTOX® is used to treat their chronic headaches, jaw clenching, and muscle spasms. BOTOX® is also one of the most effective treatments for excessive sweating (hyperhidrosis) of the underarms, hands, and feet. Dysport® is very similar to BOTOX® and relaxes facial muscles to prevent and improve wrinkles. This injectable protein formula also treats excessive sweating and muscle spasms, but it has been shown to be less consistent than BOTOX® for some patients. This botulinum type A injectable treats severe vertical frown lines between the brows. XEOMIN® can also be used to treat abnormal neck pain and muscle movements, such as eyelid spasms. In head to head studies, XEOMIN® required slightly more product when compared to BOTOX® for the same clinical result. As we age, we lose both bone and fat in our face, which can cause a hollowed-out look. Dermal fillers work by replacing this lost volume. As volume is restored to the skin, wrinkles are improved, and youthful facial contours are restored. The effectiveness of each of these fillers in treating wrinkles has been evaluated and approved by the FDA. This natural hyaluronic acid (HA) smooth gel filler is used for lip augmentation, correction of lines around the mouth and eyes, nasolabial folds, and filling depressed scars. HA fillers are the standard of care due to their natural look, their low side effect rate, and the fact that they can be removed easily if the patient desires. Results with JUVÉDERM® are approved to last up to a year. This is the newest filler on the market. VOLUMA™ is a long-lasting HA filler used to replace mid-face volume lost around the lower eye and cheek bones. In clinical trials, VOLUMA™ has been shown to last over 24 months. This product is an amazing blend of the safety of HA with the longevity of less forgiving products such as RADIESSE® and Sculptra®. Sculptra® is made from poly-L-lactic acid (PLLA) that plumps volume-deficient areas of the face by stimulating the body’s natural production of collagen. This is one of the most enduring treatments, with results lasting for up to two years or longer. RADIESSE® is made of calcium hydroxylapatite (CaHA) microspheres in a water-based gel, and it forms a structure to help your body produce it’s own natural collagen. Immediate improvement is seen when injected beneath the skin where there are lines around the mouth and eyes, nasolabial folds, and depressed scars. Improvement can be seen for one to two years as the body continues to produce its own collagen. Restylane® is the oldest HA filler. It has a clear gel formula that mimics the body’s natural HA to restore volume to areas of the face. It is best for fine to moderate facial wrinkles, such as nasolabial folds, and for adding volume to the lips. Wrinkle reduction and volume correction provided by Restylane® injections generally last six to eight months. If your face has developed signs of aging, restore a youthful appearance by giving injectables a shot! These very fulfilling treatments are offered at Colorado Skin & Vein in Highlands Ranch. Dr. Verebelyi and his staff have over 10 years experience giving women a natural look. They can help determine the best injectable treatment(s) for your individual needs. To schedule your consultation, please call (303) 683-3235 or fill out our online contact form.